Feck, that was gorgeous. The dress I mean. Ive actually clicked on the link, even though I havent sewed with a pattern in all my life. Thats probably the best photo Matt Smith has ever taken…IMO hes not as good looking as David Tennant, but then I didnt like him when he took over and he grew on me. Shes calculating the angle shell need to remove the photographers assistants liver and sell it on the black market.She has that freaky Tinkerbells-evil-twin thing going on. Pixie face, scary stare. I think I actually prefer him in bow tie and tweeds… Then again, my love for the Doctor might have more to do with the spaceship!Also: Pockets! I might buy this one…Is there any way to wear a tweed dress without looking like a librarian/schoolgirl? http://www.redcarpet-fashionawards.com/2010/01/29/dita-von-teese-front-row-jean-paul-gaultier-spring-2010-couture/A tweed dress thats neither librarian or schoolgirl… however, its not a look I could pull off! I love this! Id buy the pattern and re-grade it to fit, BUT — only the bodice is there! What I want is the interesting pocket insert into the skirt side fronts. I have nothing like this; guess Ill have to add it to the ebay search list. beautiful pattern. Do not think new Dr. Who is cute at all -blech! To each her own though!Thanks for the funny post. Question?Who in the world has a 29 inch bust! Good Lord! Oooh! So, so pretty! I especially love the green with the little white dots, so Id invariably be disappointed when whatever fabric I used wasnt dark green with white dots. I get your fear of the eyeless SciFi people, but the thing that still scares me when I think of it is an episode of The Twilight Zone where a girl had no MOUTH! I think her little brother wished it away; it was a really long time ago that I saw it. Scared the beejeepers out of me. Even scarier than the thought of Doctor Who without David Tennant. Shudder. no eye And no noses!!! and 29 busts! Even scarier! Why WOULDNT you want to look like a librarian in your tweed dress? Personally I have no higher aspiration. 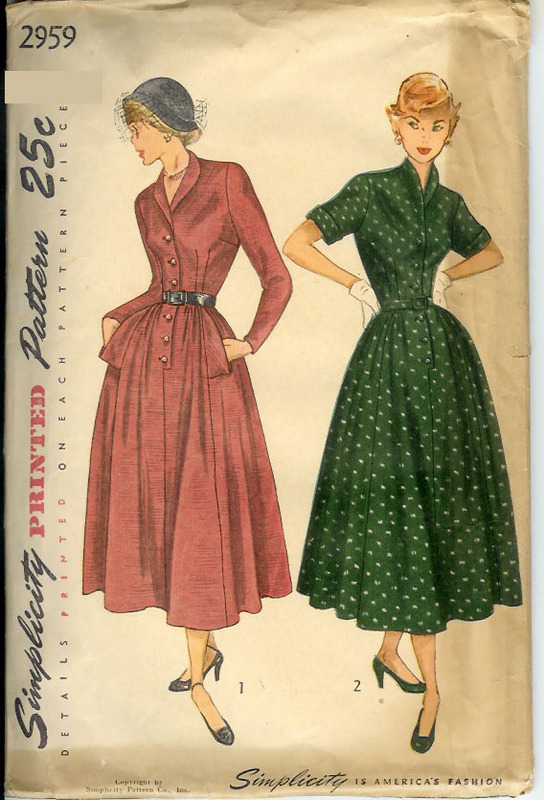 Big Con: I will never ever have legs as long as the women on patterns. Not fair.